This fully automatic blowing machine is new generation of linear blowing machine. Currently, China linear single-mold speed still stays 1000-1100BPH, while international max single-mold speed has reached 1800BPH. In view of this situation, we developed China first high speed linear blowing machine: FG series blowing machine. The single mold speed can reach 1800 BPH. FG series blowing machine is developed completely independently, it has our own intellectual property rights, and has obtained more than 10 national patents. FG series blowing machine is composed of three modules: prefrom elevator, perform unscrambler and host machine. It is equipped with automatic perform loading and unloading system. 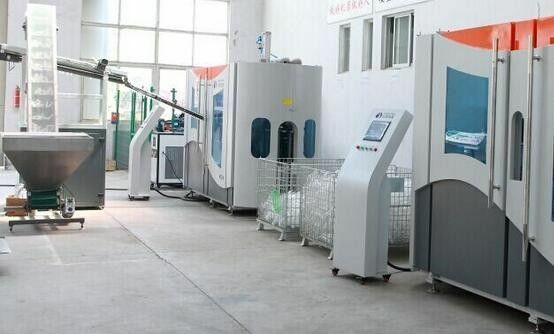 The machine is applicable for all shapes of drinking water bottles, carbonated bottles and hot filling bottles. The uniquelinkagecamcan finish mold-opening, mold-locking and bottom mold-elevating in one movement, the blowing period is greatly reduced to 2 seconds. Besides, it has the option item of exploded bottles ejection unit and oven and preform temperature detection unit, this can ensure the 99.9% rate of finished products.